This will be a short posting since I’m working off a small 10 inch screen and don’t find writing to that much of a “joy” on it. (large HD screens have spoiled me). 🙂 But there is a possible Wyckoff chart pattern that call one to be particularly attentive here. Please reference the chart below. The latest bar on Friday could be what is known as an UpThrust bar, that is a wide range bar breaking to new recent highs on lower than average volume. 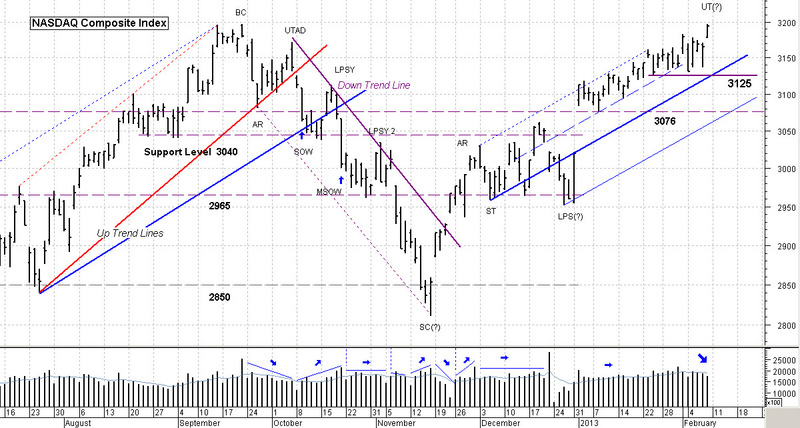 I’ve drawn a purple horizontal line at the 3125 level on the NASDAQ Composite Index. That will be a price support level that should hold IF the market continues to move higher. A close below that level (which also breaks the blue upward trend line) would likely mean a correction is in place. The next level of support would be the dashed blue line price level area. Now, I’m not thinking that this could be a major turning, just a correction. But in any case we really won’t know If or How Much untill it starts and we see how others react to it. The reaction will be shown in the form of bar spreads coupled with volume and the time period it spans over. So be cautious, as this may also be a good opportunity to do some buying if a correction is brief and shallow. Keep in mind that a continued move higher on light volume would negate a preliminary UpThrust bar pattern. So I remain invested but keeping an eye on the Exit sign. I don’t want to give up any hard won profits since the first of the year. I’ll put more out there next weekend as I get “back to normal”. As always, be careful, be watchful. Cheers. …. Tom ….